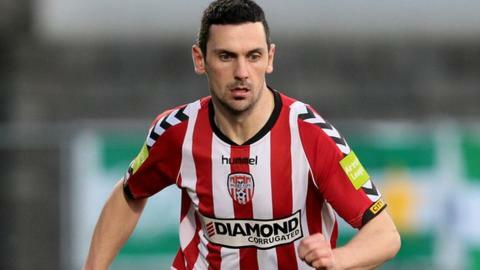 Mark Farren replaced Liam Coyle as City's record scorer in the FAI Ford Cup quarter-final rout of Mervue. David McDaid headed in the opener and Farren slotted in before Patrick McEleney's spectacular long-range chip over Conor Gleeson to make it 3-0. Pat Hoban pulled one back for the First Division side early in the second half before McDaid netted his second goal. Two quick Farren strikes saw him secure a treble and pass Coyle on 113 goals while Ryan Curran completed the rout. McDaid headed in from a 15th minute corner to put Derry ahead and Stephen McLaughlin hit the Mervue woodwork two minutes later. Farren netted from Simon Madden's cross before McEleney's audacious chip over Gleeson from just inside the Mervue half after 35 minutes. Hoban's 35-yard cracker seven minutes after the restart gave United hope, only for McDaid to fire home from a Barry McNamee pass four minutes later. Farren equalled Coyle's total of 112 goals on the hour mark and he broke the record with a fine side-foot strike a minute later. The striker received a standing ovation from the Brandywell faithful, who saw Curran hit an empty net from McDaid's cross with 13 minutes left. In Friday night's other quarter-finals Dundalk won 1-0 at Bohemians, Shelbourne edged Shamrock Rovers 2-1 while St Pat's Athletic and Drogheda United played out a scoreless draw.